Although I don’t hate McDonald’s hamburgers, I can’t say I’m big on Big Mac’s. In my opinion, Burger King is better than McDonald’s, but sometimes their burgers can be a bit too greasy and messy to eat and, as I travel around from one place to the next, I’ve discovered there many better alternatives. When I’m in Spain, I’d rather go to The Good Burger (TGB). The portions are slightly smaller, but the burgers taste meatier than a Big Mac and don’t carry as much grease as a Whopper. 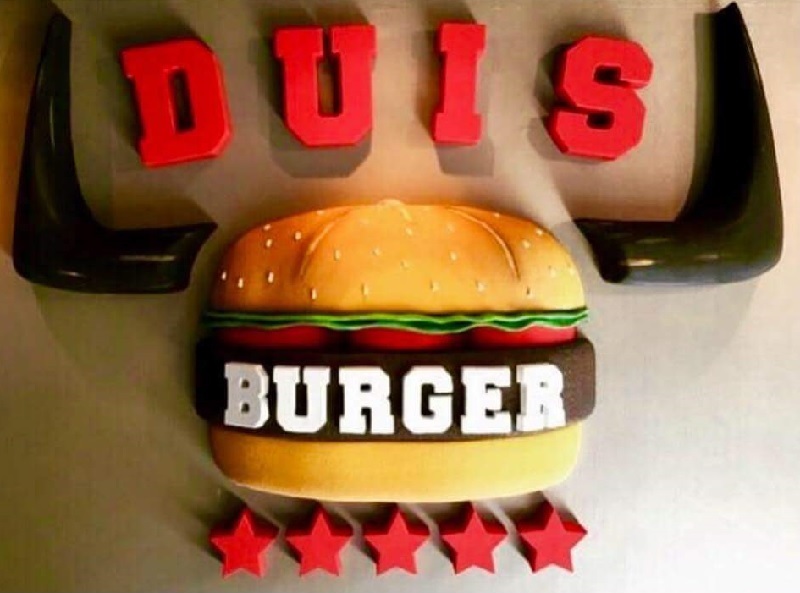 In Duisburg, Germany, the local hamburger restaurant is called The Duis Burger and I find the burgers there are much better than McDonald’s. Unlike TGB, The Duis Burger is not part of a big restaurant chain. It’s independently run and there is only the one so unless you visit Duisburg, you will not be able to try this particular hamburger. As is normally the case with hamburger restaurants, there are a variety of different burgers on the menu and some of them are so tall and ambitious they have to be impaled on a skewer to stop them toppling over. I don’t normally go for the overly complicated options, especially not on a first visit, so I ordered the basic Duis Burger. I nearly always go for the standard options. When you do that it makes it easier to make a fair comparison between restaurants. If I like the standard burger and return at a later date, that’s the time I may try something else. Although my burger was not unusually tall, a skewer had been added to help keep everything in place and it was a nice big skewer that was easy to see. If my burger has to have a skewer in it, that’s the kind I like. I once ordered a hamburger in Portugal and it came with such a small skewer I never noticed it until I took a bite and felt it sink into the top of my mouth. Needless to say, I didn’t think that particular restaurant was better than McDonald’s. Unlike many other hamburger restaurants, The Duis Burger does not provide sauces in little pots or sachets. There’s a trolley that contains a few sauce options in pump-action containers. As is normally the case with hamburgers, there is a little sauce under the bun, but the amount provided is probably slightly less than you get with a lot of other burgers. That’s okay though. Not everyone likes to eat burgers that are drowning in sauce and Duis Burger customers who do like a lot of sauce can soon add some more at the trolley. Adding extra sauce is easy, getting rid of excess sauce is not, but in my case, the sauce provided was about right. I only needed to visit the trolley to add a little mayo to my chips. The last time I ate a Burger King burger was in Granada. It was about 2 am in the morning and I only went there because TGB was closed. I remember biting into the burger and seeing a lot of fat oozing out the other side and onto my tray. I hate greasy food. I threw a lot of the burger away. I had no such problem with my Duis Burger. The meat was juicy, not greasy and it tasted really good. The chips were very different from the ones served in McDonald’s and Burger King as well. They looked home-made. I don’t know if other options are available, but the chips served with my burger appeared to be made from sweet potatoes. Whatever type of potato it was though, it’s been a long time since I had the opportunity to eat such a tasty portion of chips. 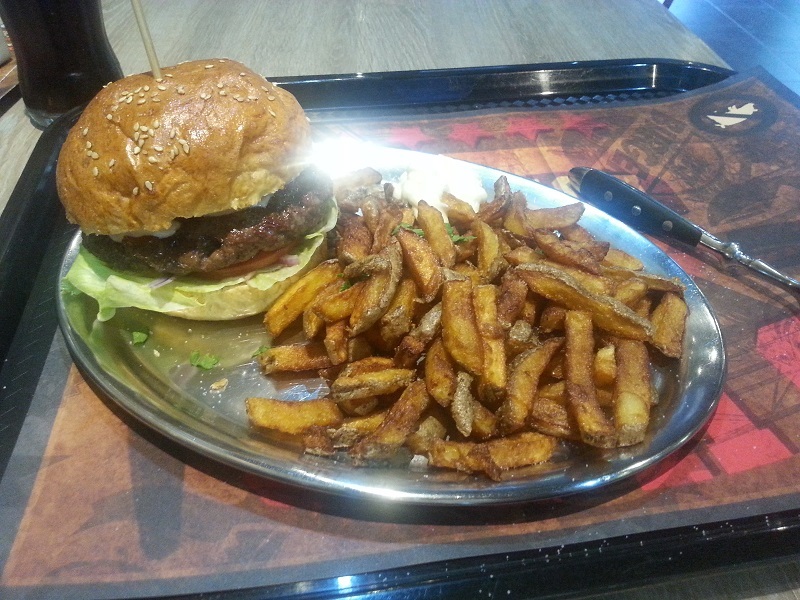 This is only a personal opinion, but if you ever find yourself in the Duisburg area, feel like a burger, and are hoping to find a hamburger restaurant that is better than McDonald’s, The Duis Burger is the definitely the place to go. Previous Article Previous Article: How the German Pfand System Works: Stop Throwing Money Away!